Everyone loves a nice, hot cup of coffee in the morning, even though for some it is seen as an acquired taste. Unlike regular coffee that requires somewhat of a tedious preparation process, instant coffee is a lot easier to prepare. 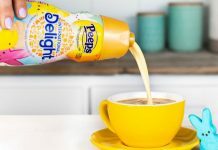 Not only that but in terms of actual taste, some instant coffee brands offer a quality similar to what you get from a reputable coffeehouse chain, both in regards to the coffee’s flavor and lasting aroma. With a quality and taste to rival what some coffee shops have to offer if not even better, it is easy to understand why some people have turned towards instant coffee for their daily caffeine needs. For the most part, good instant coffee delivers roughly the same flavor and aroma as traditionally packaged coffee. That said, you can definitely expect low-end instant coffee to have a slightly different taste. To ensure that you get nothing but the very best, we put together a list of the ten best instant coffees out there for you to check out. Made from high-quality, ethically-sourced organic beans, this instant coffee by Mount Hagen brings out a mild and well-balanced aroma and flavor with no bitterness to speak of. To ensure a consistent quality and uniqueness and environmentally sustainable coffee production, Mount Hagen partners with designated coffee growers and it shows in the overall quality of the instant coffee they make. Not only that but we should also point out that this particular coffee stands out for being one of the most flavorful you can find on a budget. Nescafe’s Espresso 100% Arabica is a great instant coffee option for making a quick quality shot or two of nice-tasting espresso. Made using 100% selected Arabica beans, this espresso has well-balanced flavor, a flavor that isn’t just smooth but one that also forms a great creme layer on top. Prepared in proper water-to-coffee ratio, this Nescafe Espresso is excitingly rich and full-bodied, which is precisely what you need to look for when buying instant coffee. Another great instant coffee choice, the Folgers Classic Roast is both smooth and rich by most standards. This instant coffee blends quite easily and well, which makes it a wonderful mix-in for your morning shakes. Not only that but it is also available in packets, making it easier for you to set up portions. As such, the crystals remain dry in your backpack, suitcase, or at the office without losing any of their properties. On a related note, let us point out that the crystals are premeasured, and yet you can still adjust the concentration of your coffee if needed. In this case, however, the flavor stays consistent regardless of the dosage. From one of the world’s most popular coffee brands, the Starbucks Via Instant is a medium roast made from 100 percent selected Columbian Arabica beans. It is a great instant coffee for making a rich, well-balanced refreshing cup. What’s more, this coffee blends exceptionally well in either hot or cold water. As such, if you want some nice, smooth iced coffee to cool down in style, you have this instant coffee making a great base for a more complex brew. This instant coffee from Douwe Egberts is a truly indulgent dark roast rich in flavor, bold, and full-bodied. Packaged and properly sealed in a quality glass jar, the Pure Indulgence retains its freshness and flavor for a surprisingly long amount of time. The fact that it blends very well makes it a great addition to your homemade desserts and lattes as well, a versatility not many instant coffees offer at this point in time. An instant coffee made of 100% premium-grade, ethically-sourced coffee beans, this is a flash-frozen option that keeps the flavor of a fresh brew for an impressive amount of time. It is a lighter roast blend, refined and smooth for your great morning dirty chai or mocha. Blending very well, Nescafe Taster’s House Blend makes for a refreshing treat after a long, busy day. If you want, you can even stir in a little hazelnut creamer, adding a touch of some chocolate syrup. 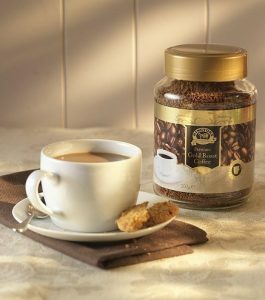 Douwe Egberts’ Pure Gold is a medium roast instant coffee that offers a well-balanced, smooth flavor without a hint of bitterness. For its rich aroma and creaminess, it is one quite addictive coffee choice. Besides being so delicious, this coffee blends quite well, working quite good for iced coffee and mochas. It is also great for preparing something particularly decadent due to its tremendous versatility. Being 90% acid neutralized, this Kava Instant Coffee has just 50% of the acid contained in regular coffee, making it unique in this regard. Not only that but the Kava coffee is made using premium-select beans for uncompromised flavor quality. For its low acid level, it is a great pick for people with sensitive stomachs or for people who want to incorporate it into a strict diet. However, it has this well-balanced, rich flavor and it blends quite well. This makes it is ideal for making a decadent mocha, with a mix of hot cocoa or milk. This espresso coffee from Medaglia D’Oro is made from a quality blend and is double-roasted to provide a unique, richer flavor compared to single-origin roast coffee types. Its particularly bold flavor and richness make it stand out not only for its taste but also for its long-lasting aroma. Moreover, it forms a thick cream for a delicious instant espresso, which isn’t something many instant coffees tend to offer. The coffee is also very smooth, well-balanced and properly blends with other beverages. A great quality choice out of many instant coffee brands, the Maxwell House original is ideal for those who want a medium yet rich roast. Available in an 8 oz. jar, it is enough for making 120 cups of tasteful and refreshing coffee at a moment’s notice. Even so, we should point out that for those of you accustomed to stronger stuff, this particular brew might be a bit mild. It is still a convenient and rich choice regardless, mainly for its long-lasting flavor and the fact that it can be stored with ease in almost any conditions. Overall, it is perhaps one of the best instant coffees the market has to offer right now. With opinions mixed on whether instant coffee delivers the same flavor as traditionally packed coffee, it usually comes down to personal preference. In this respect, if you simply cannot be bothered to go through the tiresome process of grounding your own coffee, then perhaps an instant coffee might do the trick. We all know, of course, how snobbish some people can get when it comes to their choice of coffee and the lengths they go for a high-quality brew; and yet, not many people can really tell the difference if the instant coffee is of a high enough standard. With this in mind, let us find out what makes a good instant coffee and what to look for when buying one yourself. Caffeine Level – The first thing you need to consider when buying an instant coffee of any kind is the caffeine levels it contains. We say this because caffeine levels can determine just how strong of a flavor the coffee has, just as much as it affects its potency from a more chemical standpoint. In this respect, keep in mind that a high caffeine content can pose quite a risk for pregnant women or for people with a sensitive stomach. For the most part, the caffeine levels of an instant coffee are displayed on the packaging in grams per serving. As such, if the coffee contains more than 60 grams per serving, then you should perhaps consider a different brand. Beans – Another thing to consider is the type of bean, mainly the production and country of origin. As you may already know, some coffee enthusiasts prefer coffee grown in a certain climate, in countries like Brazil, Netherland, Korea, or Colombia. On a related note, you should employ a packaging criterion, in the sense that some manufacturers can definitely pack it better than others. 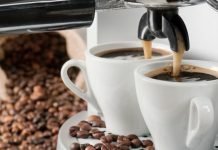 In this regard, Italy and the United States stand out as some of the best countries when it comes to coffee processing, which explains why they also have the most reputable manufacturers. Flavor and Additives – You also have to keep in mind that some brands include all sort of additives to facilitate the fast-brewing process. This is intended to achieve their crema layer thanks to these additives, which for the most part, are relatively healthy. That said, we should point out that people tend to have mixed opinions on the use of additives and how needed they are for a perfect brew. 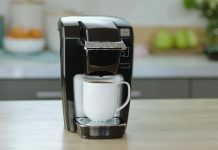 In fact, if you enjoy the taste of traditional coffee, chances are that you will not exactly take a liking to any additive-based instant coffee. Packaging – Depending on the brand and composition, instant coffee can differ to some extent between manufacturers. Interestingly enough, some brands even employ a multi-pack type of packaging, in the sense that you can use each individual packet for a single serving. This is quite convenient for people who do not want to go through the hassle of having to prepare their coffee or trying to figure out how much to use for each brew. Not only that but individually packed instant coffee is also very practical when traveling as it is easy to store and easy to carry. Roasting – A good coffee may start with the cultivation but most of the aroma comes from the roasting and grinding. The process involves green coffee beans that are then roasted to bring out their inner aroma, a process usually done at a roasting plant where coffee beans are placed inside a rotating drum that is then subjected to hot combustion gases to roast the coffee. This process causes the coffee’s inner aroma to surface and it is usually done with close supervision. We should point out, however, that temperature also plays a big role in the roasting process, as lower temperatures offer a somewhat better taste and stronger aroma retention. Price & Branding – Even though the price doesn’t always reflect the quality of a product, the opposite is somewhat true when it comes to instant coffee. In fact, some of the best instant coffee out there is made by reputable brands, thus commanding a higher price than most low-end versions. This is because big brands can afford to invest a lot of resources in research and development, always looking to improve on their already good coffee. You may understand the gist of it, or how to best prepare instant coffee, at least in principle. Even so, a surprisingly large number of people do not fully grasp the concept in the sense that they treat instant coffee just like regular, traditionally prepared coffee. To put it bluntly – all you have to do is pour the coffee into a recipient of your choosing and then add hot water to it. Bear in mind that different types of instant coffee demand different ratios when it comes to how much water per teaspoon of instant coffee you should add. For the most part, however, you need about one teaspoon of instant coffee per cup. Although most instant coffees are used in lattes or mochas, for the most part, you can still employ instant coffee as a flavorful ingredient for a few other recipes. So if you have some leftover instant coffee, keep in mind that you can use it to prepare Tiramisu Cheesecake, Coffee Brownies, Marbled Mocha Loafs, White Chocolate Latte, Hazelnut Macchiatos, Dirty Chai Lattes, and a variety of other coffee-based dishes for an added coffee flavor. Consider replacing water with hot milk to enhance the coffee’s flavor and to add to its overall aroma. Grind your coffee with a spoon of butter oil for added flavor, either in a traditional grinder or a blender of your choosing. You can also flavor a cup of instant coffee with vanilla, cinnamon, or cocoa powder. Portion it according to your personal taste rather than what the label instructs. This way, you can make it stronger or more flavorful without employing additional ingredients. Try to dissolve the powder in cold water before adding hot water; this process can thin out the spread of the coffee inside the cup, preventing leftover powder from forming a layer at the bottom.